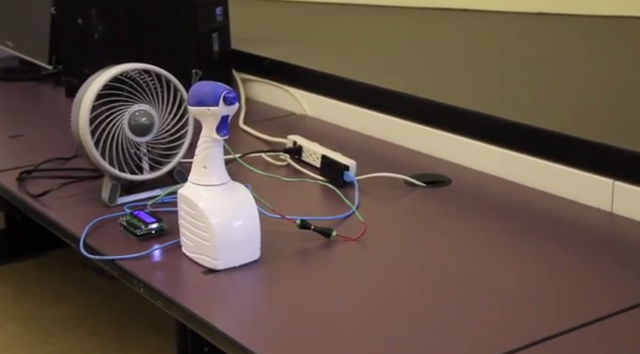 Researchers at York University in Canada have used vodka and a desk fan to send a new type of text message. The team were able to encode the alphabet in evaporated alcohol and assigned different concentration levels to represent bits 1 and 0. During the experiment, the chemical signal was sprayed 12 feet and then decoded by a receiver measuring the increase and decrease in alcohol concentration. The resulting message due to the varying concentration levels was “O Canada”. Professor Andrew Eckford, who led the study, explained the reason for this experiment saying that chemical signals can reach places that wireless signals cannot. Dr Weisi Guo from the School of Engineering at University of Warwick, who also worked on the research team, said that these types of chemcial signals could be used to eventually communicate on a nanoscale to “carry out a specific task such as targeting drugs to cancer cells.” Although this may seem a little far-fetched, if the scientists can develop the right concentration levels then it becomes a nearer possibility. Molecular communication happens all the time in nature, with plants and animals using pheromones to transmit long-range messages. Humans have never been able to control sending continuous data this way, so this research is very exciting.